Iron Fist (2017), TV-MA, 13 Episodes - Iron Fist is the fourth and final solo series from Marvel/Netflix before this fall's team up series The Defenders (following Daredevil, Jessica Jones, and Luke Cage). The series got off to a bit of a rocky start in the press over the past week, receiving many poor advance reviews, a foreign experience for a Marvel Studios or TV project (although it should be noted that only the first six episodes had been released to early reviewers). After blowing through all thirteen episodes myself last weekend, I'm happy to report that those negative reviews were overly harsh, but that's not to say that it doesn't have its shortcomings. Luke Cage (2016), TV-MA, 13 Episodes - Luke Cage hit Netflix last September, and while I made my way through the series at the time (albeit slower than the previous Marvel/Netflix series), my juggling of two jobs kept me from getting a review together. With Iron Fist coming out this Friday (the latest Marvel/Netflix collaboration and the last solo series before team up series The Defenders), I figured there was no better time to finally get my thoughts on Luke Cage down 'on paper'. Since this series has been out for a while, this will likely be shorter and less in depth than my previous Marvel/Netflix reviews. This is also due to my limited familiarity with the character from the comics. The beginning of 2017 has been wonderful for fans of collected editions of Daredevil. 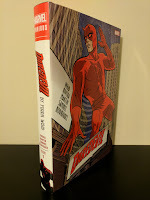 February saw the release of the first Silver Age Daredevil omnibus and the first week of March gave us this collection of the first half (almost exactly to the issue) of Mark Waid's run that began in 2011. By the middle of the year, reprints of the two omnibi collecting the Ed Brubaker/Michael Lark run will have also been released. Fortunately for my wallet, I already have those two collections from their original printing a few years ago. Logan (2017), R, 137 minutes - It's hard to believe, but it has been seventeen years since 2000's X-Men introduced Hugh Jackman to the masses as the live action interpretation of one of the most popular comic book characters out there: Wolverine. Over that time, he has really cemented himself as the physical embodiment of the character and Logan marks his ninth and final turn as the iconic mutant on the big screen. It is a wonderful, heartfelt send off, even if there are a couple shortcomings. Jackman's final foray into the mutant world is loosely based on Mark Millar and Steve McNiven's 'Old Man Logan' story from the comics. While the overall story differs significantly from the source material, key elements that do carry over to the film, including that it takes place in the future (2029 in this case), Logan has aged and doesn't heal the way he used to, and the mutant population in the world has been significantly reduced.